In the beginning, God said, let us make a woman in our image, and let us call her Grace. Endow her with an engaging smile and beautiful soprano voice, and then lead her as she is studying music to The Salvation Army. So God did create Grace. And he saw that she was good. Then God said, let us make a dashing young man, and let us call him Peter. Commission him as a lieutenant in The Salvation Army, and appoint him to lead the Korea National Songsters, where his eyes will one day meet those of Grace, and love may bloom. And so it was done. And once again, it was good. God then called Grace to officership, and she married her musical sweetheart 12 days after her commissioning. It was the beginning of a magnificent symphony, a divine creation, with Jesus holding the baton. The subsequent movements of Grace’s life and service, whether they were played allegro, adagio, andante, or even largo, always brought to mind recurring themes—gratitude to her savior, dedication to her calling, and boundless affection for her husband and her children. She was inseparable from Peter. If you met one, you would see the other. They laughed together, they cried together, they worked together, they traveled together, always side by side. This itself sent a message. And God saw, and the world knew, that this too was good. In addition to her musical ear, Grace was also blessed by God with an eye for beauty. I personally can recall as a cadet marveling at the magnificent floral arrangements that she often created. For me and my fellow cadets, the blended colors and rich textures of those arrangements never failed to enhance the beauty of a moment spent in song, the lilting poetry of a Scripture reading, or personal reflection on the things of God. It was good. And Grace knew that it would be. In fact, there were many things that Grace knew. Others sometimes wrongly thought that she didn’t understand English. But she did. She also knew finance and budgets. She was honest and insightful and discerning in her judgments. She was a skilled administrator. She was direct in manner and encouraging in spirit. Now, this is not to say that there weren’t communication challenges. For example, my wife had the privilege for several years to serve as Grace’s administrative assistant. Jolene’s responsibilities included filing letters in folders marked with Korean labels. Not easy. She was also asked during Grace’s absences from the office to feed the fish and care for the plants. But based upon their conversations, my wife was never truly sure how much food the fish should actually receive, and she was never entirely confident of those things necessary to ensure that the plants would continue to flourish. In short, it was terrifying. But Grace’s attitude was forever gracious and, as needed, completely forgiving. It was good. And God said, let Grace sing to our glory. Let her voice move others to a closer walk with me. And so she did. Many times. She most enjoyed singing with her husband, their music reflecting their life together—always joyful, never discordant—characterized by perfect harmony with the melody that God had ordained. She sang in quartets with her husband and Ivor and Janette Bosanko. And she memorably sang a solo one Sunday evening in Hawaii. Her selection, “At Peace with My God,” was wrapped in her personal testimony on the promotion to Glory of her son John in 1980. She sang that night not to bemoan her own fate or celebrate her own strength, but to point others to the power, the comfort, and the mercy of Christ. Such moments must have been painful for Grace. Yet she did it, and as God is known to do with the stories of those who love him, he used it for good. Grace always said yes to her Lord. Fully and unreservedly. Without hesitation. Regardless of what she was asked to do or where she was asked to go. “This is my responsibility,” she would say. And in each of the roles that she filled, Grace never failed to expand our understanding of what was good for God’s people. She conducted the first Territorial Women Officers’ Retreat in this territory, bringing in Dr. Roger Green of Gordon College and Dr. Catherine Kroeger, founder of Christians for Biblical Equality. In so doing, she widened the Army’s vision for women in leadership. And she loved others. She felt deeply for the ministry of the Adult Rehabilitation Centers. And together with her husband, she administered the Man Young Scholarship Fund, which since its founding in 1997, has provided financial assistance to more than 1,000 students in need. And God said, what we have created in Grace should become a legacy. So let us make a family. And so it came to pass that there was Miriam and John, and later Matthew and Julia. All of whom—God and Peter and Grace agreed—were very good. In fact, if you ever asked, Grace was happy to tell you so. Her life was a model of faithfulness, perseverance, self-sacrifice, commitment, and love. It was good. But that is no surprise. Because he had planned it all. As God has directed, we did not gather for this Celebration of Life simply to recount cherished memories of the one whom we have loved and lost. We assembled rather to worship God, our creator, who has made all things good, to celebrate our faith in him, to contemplate his gift of everlasting life, to invite him to help us mourn in the comfort of his promises, to understand more completely his incomparable love, and to dwell in the wonder of his grace. In her retirement years, Grace maintained a small vegetable garden. There she planted, she watered, she nurtured, and she trusted God to bring the increase. And when he did, she reaped a nutritious harvest for herself and her husband. It was, in many ways, reflective of her life. 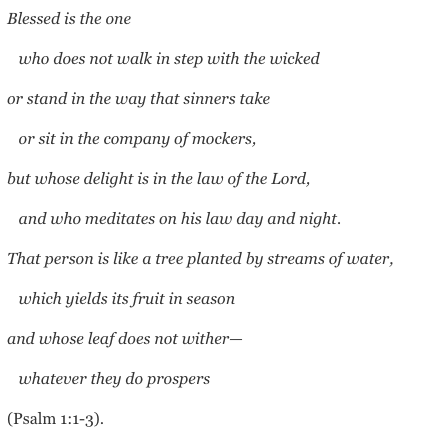 As Psalm 1:1-3 makes clear, the person whose delight is in the law of the Lord, who meditates upon it day and night, will be like a strong tree planted by streams of water. And the fruit of that life is not only a source of strength for the body, but delicious as well. The taste of such a life lies sweet upon our memory. I find it compelling that this image of fruitfulness appears in the first verses of the first psalm. The richness of 149 more psalms is yet come. So it’s just the beginning. Grace is no longer with us in body, but her life and her testimony still stand, yielding fruit, with a leaf that will never wither. In divine terms, her life is just getting underway. For Grace Chang, and for anyone who claims a personal relationship with Jesus Christ, God has said that this world is only the beginning. So the music lingers. The fruit is still sweet. And that is good. That is very good.